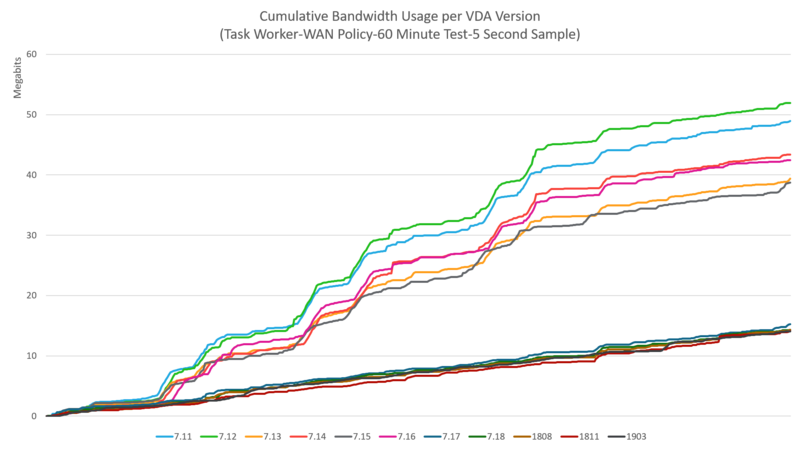 I want to see how these improvements impacts network utilization, so I ran my own simulations. I decided to run the same tests against the 7.11, 7.12, 7.13, 7.14, 7.15, 7.16, 7.17, 7.18, 1808, 1811 and 1903 releases. 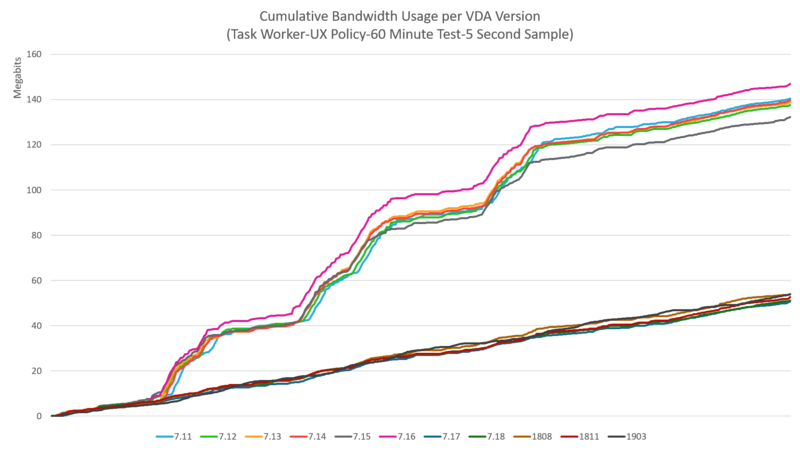 7.13: A slight drop in cumulative bandwidth usage. This drop extends through the 7.17 release. 7.18: A noticeable drop, most likely due to the H.264 Build-to-Lossless capability with the graphical knowledge worker workload. 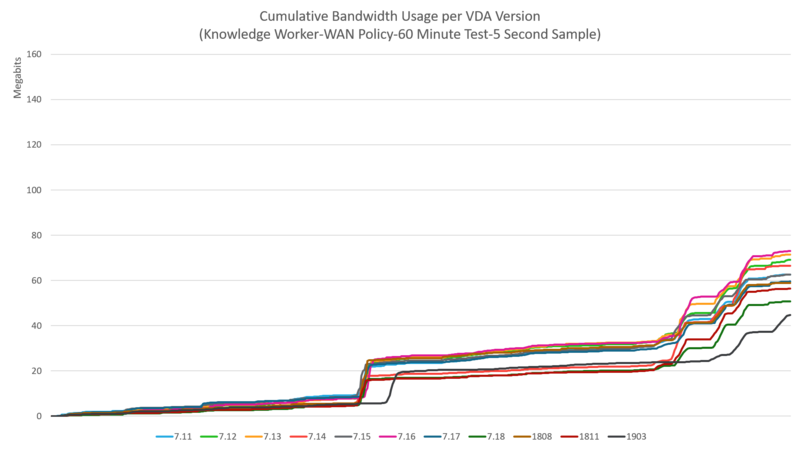 Besides lower numbers, as we would expect with the optimize for WAN policy, we see similar bandwidth reductions in the 7.13 and 7.18 releases. 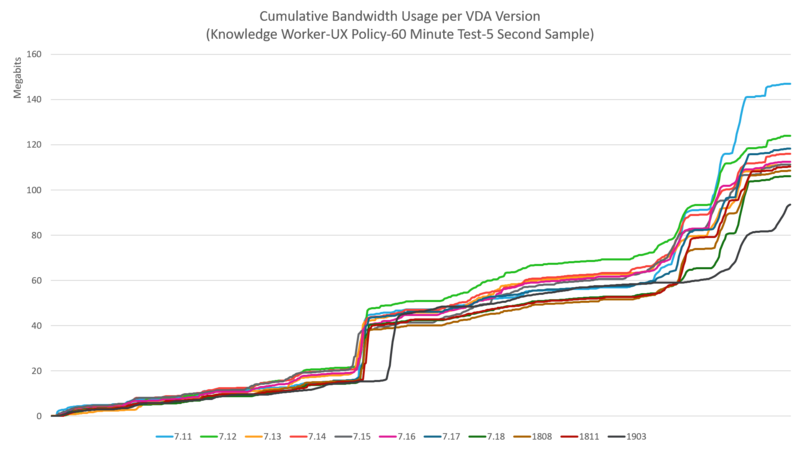 By looking at average bandwidth utilization across the 60 minute test, we can start to see these improvements a little easier. We see similar reductions in the 7.17 release. In addition, we also see the introduction of the glyph caching in the 7.13 release with the optimize for WAN policy. When we change the graph to look at the estimated kilobits per second, the improvements are quite interesting for the Task Worker. Hi Daniel, what kind of tests did you run? I’m trying to tweak bandwidth performance on my VDI for some time. What is the main reason not providing standard Power User’s BW requirement?